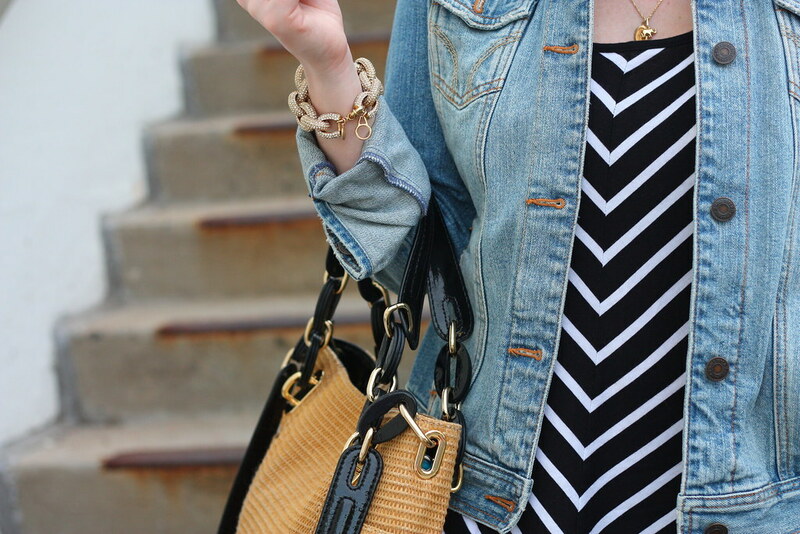 Is there a more perfect match for a maxi dress on cool spring or summer days (and nights) than a denim jacket? Methinks not. They're just so easy to toss on and still allow you to look cute/like you tried...even if you know the exact opposite to be the truth. This specific outfit was ideal for a car ride back from Pennsylvania this past weekend. I tend to love maxi dresses for long trips of any kind where you're sitting down because they're sorta like wearing a blanket. And we all know that blankets encourage naps! Do you have a go-to outfit for when you travel? Are you a maxi fan like me or is there another secret combo that I should know about? Looking for a unique gift or a fun, quirky item for you home? Then don't forget to enter my giveaway for your chance to win a gift certificate to Uncommon Goods! Perfect combination - love the idea of knotting the dress at the bottom! 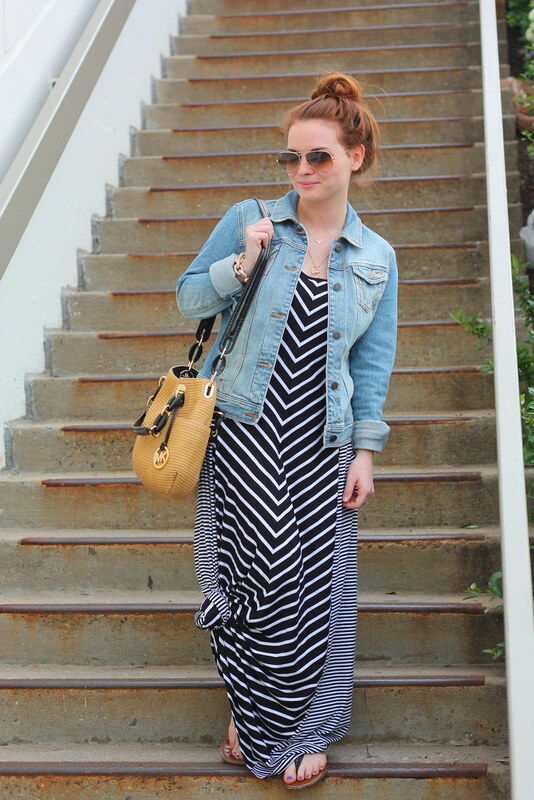 LOVE this and maxi dresses are so fab and comfy. 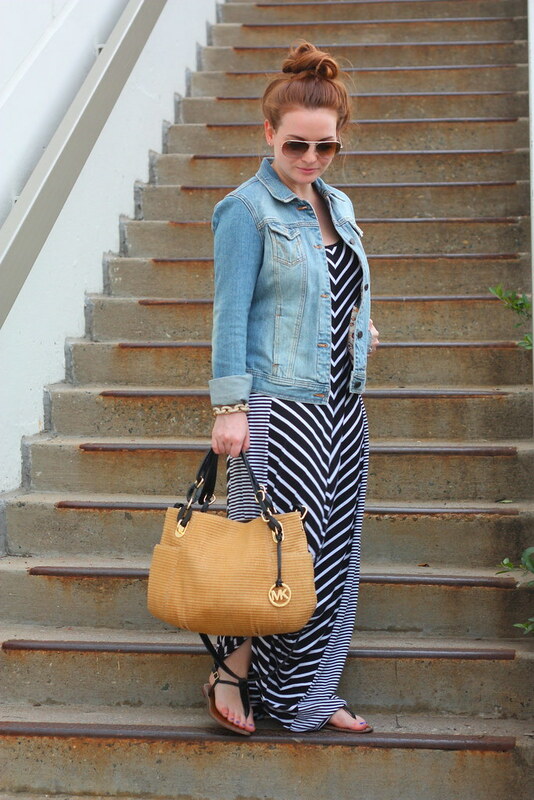 And that MK bag - omg so great for summer! love this dress, especially knotted for us shorter girls! great reminder to do that. I really need to raid your maxi dress collection..I own maybe 2 and it seems you have dozens and I love them all! Currently wearing this EXACT outfit while I type this! 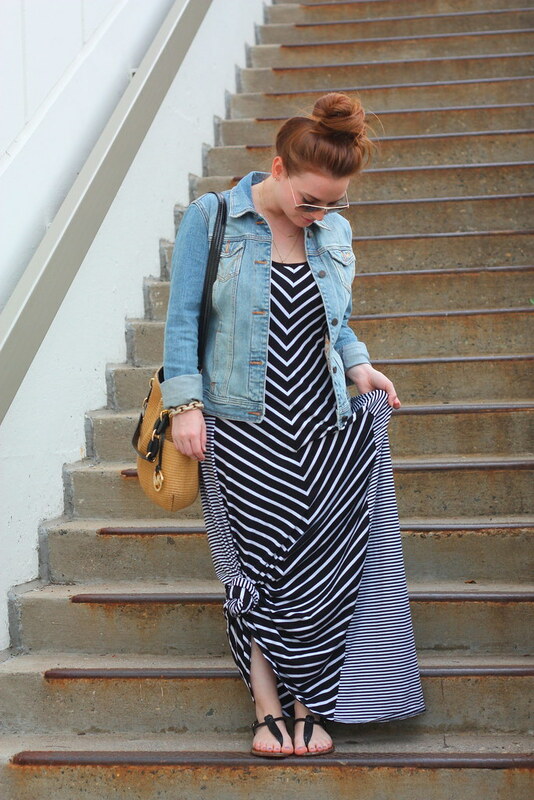 Maxi dress (black, white and pink) with a denim jacket and a top knot! Seriously so funny! And I totally agree, wearing my blanket and feel like taking a nap right this second! ;) Obviously love this look! Great bag, Ally! So gorgeous and perfect for the season! Can't believe that dress is from Kohls, I'm gonna have to go check them out this weekend :) You look super cute & I agree the jean jacket is the perfect piece to pair with a maxi! Agreed, they are the perfect combo! 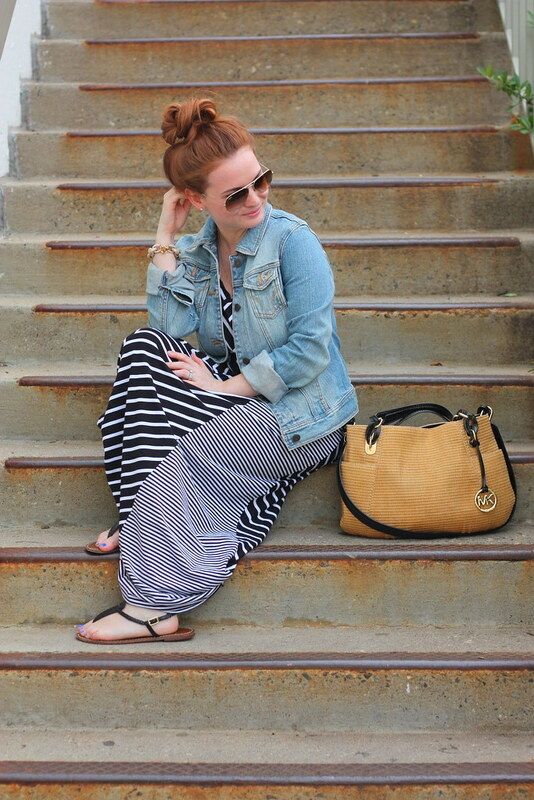 Love this maxi on you, and that bag...so cute! Great combo. 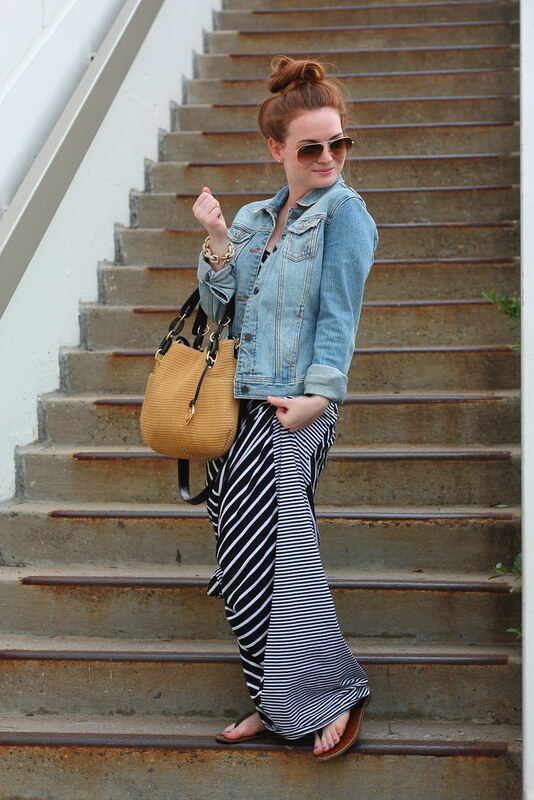 Chambray tops are also a must with a maxi!